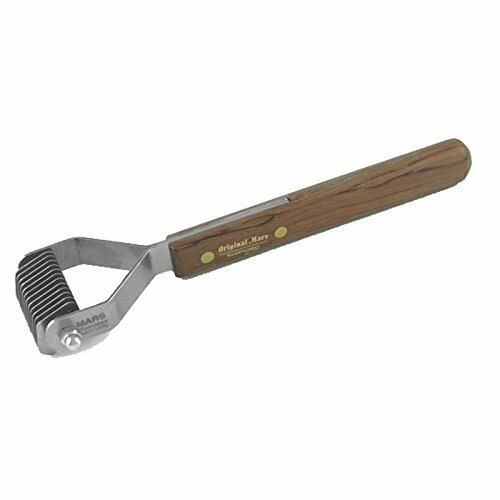 This is one of our best selling items of grooming equipment. Mars Coat Kings have the traditional wooden handle and are German engineered so you know they are of the highest quality. Coat Kings are truly the groomers friend and will remove even the toughest tangle or matt. It cuts, strips and combs in one easy time saving operation. Helps to reduce grooming repetitive strain injuries (RSI) too. Quick Guide: Coarse & Medium styles (#6 - #12 blades) for preparatory work and thinning out undercoat #8-Blade Stripper is perfect for prep work and coarser coats such as: Old English Sheepdogs Irish Wolfhounds Chows #12 Blade Stripper is ideal for heavy or double coats such as: Pomeranians Lhasas Westies Poodles Fine styles (#16 - #20 blades) for grooming heavy coats #20 Blade Stripper is ideal for finishing and carding thick, fine coats such as: Cockers Spaniels Setter Afghans Super Fine styles (#20 - #26 blades) for finishing and thick, shaggy coats (especially Spaniel breeds) #20 Blade Stripper is ideal for finishing and carding thick, fine coats such as: Cockers Spaniels Setter Afghans Top Tip: Use coarse styles to comb out the undercoat, fine styles for finishing. Quick Guide: Use coarse styles to comb out the undercoat, fine styles for finishing. The softer the coat, the finer the gap between the blades. The longer the coat, the finer the gap between the blades. Short coated dogs use closest, finest gap. For Long & Wire coats first use a course Coat King and then the fine one. (The finer the gap between the blades the more blades).